Thanks to Jackie and Sue-Ann for tweeting my posts to your peeps. I see you and appreciate you. You may recall that I held a free webinar last month on the future of site ownership. I’ve decided the info in that webinar is just too valuable to keep private. So I made it public. If you haven’t seen it already, you most definitely need to watch. We are in a major transition period with sites right now and this webinar will help you budget the time and money to make the changes to your site. And none of them are elective. We all have to get with the program, like it or not. Toward the end of the webinar I divulged more of my conversation with WordPress co-founder Matt Mullenweg too. And, I give you a report on all the things I began testing because of that conversation too. Thanks to everyone who has been participating in the Seriously Old Plugin Challenge!!! We have a great list of old plugins going, plus a few replacement suggestions too. And a few folks have let me know that they really appreciate the free Plugins Spreadsheet as a way to keep up with their plugins too. It may take a few minutes to create the first time around, but you’ll pat yourself on the back and jump for joy that you did the next time something like this comes up where you need to make plugin changes. I started mine a few years ago and I am so glad I did!!!! The Challenge runs for the month of May, but don’t wait to jump in. That gives all of us more time to help each other identify old plugins and to find replacements. Tell all of your blogger buddies about the Challenge so they can get in on all this blogger village help too. I’m in the process of running tests on a sandbox site to locate all of the places a plugin is being used on the site. That’s one of the biggest issues when you have to switch plugins. For those that use shortcode, a search for it in the database should locate it. For others, it’s a little tougher. And let this be a lesson to all of us about using plugins to put things on individual posts and pages. Some folks ran into a world of trouble when they had to switch their click to tweet type service a few years ago. I’ve also seen plugins that auto embed your media like videos and podcasts into your posts too. While they work great, they may not work forever. Or, the underlying service may disappear. I know of several folks who auto embedded their Blabs. I’m so glad I took the extra time to download them and then upload to YouTube and embed that. Blab is gone, but I’m banking on YouTube being around for a while longer. Plus, I have the original downloads no matter what. And I can search those posts by category if I ever need to change the videos out too. So, either keeping a spreadsheet of where you use a plugin, or having a way to search for those posts by category comes in real handy. It may take all of 30 seconds to add it to a spreadsheet, but that’s nothing compared to the cost and expense of finding them later. Last week we had our last live session for the SEO Workshop. It was very eye opening for most folks and helped them get their SEO tactics up to speed from doing them the 2012 way. I also invited everyone to participate in a quick survey and I’ll be sharing those results with them soon. Your feedback is absolutely invaluable to me!!!! And it will definitely help me improve the next workshop. If you missed this one, or are pretty sure you’ll want a refresher and to see what’s changed so you can keep up with the latest, be sure to subscribe to BlogAid News because they are always the first to know and get discounts on courses and workshops. Of course, those in the DIY SEO Course are going to get the biggest discount on the workshop. And, I’ve got new tutorials on the way for that course, for the new features in the Yoast SEO plugin and how to make the most of them. Plus, I’m planning some open Q&A sessions for members too, so be on the lookout for that. I want to thank my friend and colleague, Ana Hoffman of Traffic Generation Cafe, for a stellar case study on SlideShare traffic. I have a few slides on the platform, but they are all videos, and I haven’t used it in years. Ana’s post got me interested in promoting there, so I created a new slideshow on the top 10 reasons not to use free HTTPS conversion from you host. It’s a hot topic, so I’m hoping it will pick up more views than my other presentations there. Plus, now that LinkedIn owns SlideShare, it’s definitely worth me giving the platform another go. You may recall in last Tips Tuesday I mentioned my colleague Bob Dunn’s post from a year ago about why he dropped 1-on-1 WordPress training. We had a very nice chat this past week about how the industry has changed and how we’ve both had to pivot our businesses. Bob has gone full on with Woocommerce these days and has a super podcast with industry leader interviews too. So do check him out. The next version of WordPress is slated to be released June 8 with the Beta release for general testing set for May 12, so it’s right around the corner. The focus of this major release is to set the foundation for the next generation editor, called Gutenberg. The new editor is already available for testing, and it’s a whole new ballgame. They just finished the initial testing and have another round to go. I’ll be jumping in on that one and will have a preview for you. I’ll also have more details on what else will be in this new release as they begin to finalize it. So look for that post around the first of June. 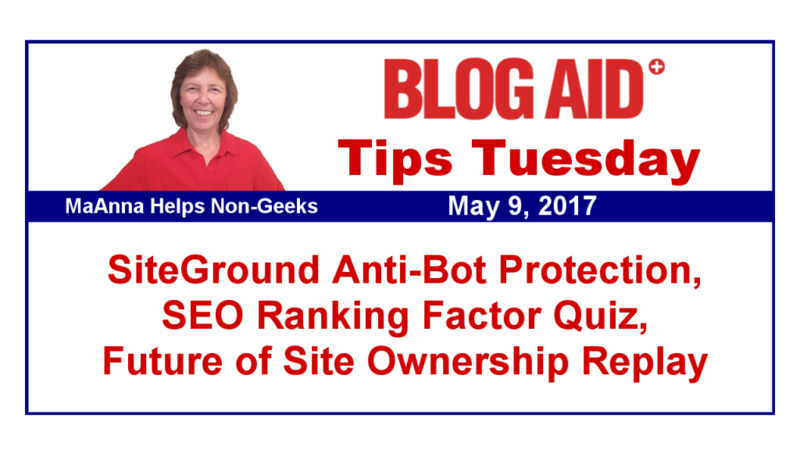 Last week, Hristo at SiteGround blogged about the new AI based bot protection they are rolling out onto all of their servers. They’ve been wowed by the fact that it is already blocking up to 2 million bad bot hits every hour. This is the kind of serious security and performance drag that I find in site audits all the time. It’s also why I advocate that everyone get on a service like CloudFlare, which is the only free CDN to offer a modicum of bad bot protection. And I’ll have a video tutorial for you soon with a way to ramp up that protection to the hilt. These bad bot hits are also what end up causing hosting overages. One of my site audit clients was paying $2400/yr more for hosting than she needed because of it too. Listen to her tell you about it directly. Considering so many of these bots are conducting a brute force attack on your WordPress login, this move by SiteGround is going to help protect your site as well. I have to say, SiteGround’s efforts in the past year to be the best host on the planet have most definitely impressed me. And their tech support is getting better and better all the time, and that was my main issue with them. I’m also going to be chatting with Hristo about offering a shared reseller package that is tailored to those of us who have multiple sites, but are not resellers. What they have now is just too expensive. And it’s a major security issue to just lump all of your sites together under one cPanel. So, we’ll see where I get with that. The main thing is, I’m delighted to have Hristo’s ear to make the suggestion!!! I sure do appreciate you using my SiteGround affiliate link if you’re thinking of switching hosts. It helps support all of the free info I deliver here on BlogAid. In the Future of WordPress Site Ownership webinar, I revealed the conversation I had with Matt Mullenweg about Automattic purchasing Pressable Hosting and why it is a viable option, especially for those with smaller sites. They already have a free trial period and the nice folks at Pressable extended mine so I could give it a thorough check. Everything is fine with it, but I found the on boarding process confusing. So, I closed that trial account and I’ll be getting a new one so I can take screenshots all the way through the first steps. I’ll have a tutorial for you on that, plus a review of Pressable when I’m done. So look for that in the coming months. And be sure to watch that webinar replay to see why you might want to consider a move to Pressable and if it will be a right fit for you now. Last week I mentioned that I wasted a lot of time writing new tutorial scripts for W3TC. There are many nice new features, including a whole bunch of new settings for HTTPS. And as great as the plugin performs, it’s just not stable enough for me to recommend anymore. I have a blog post coming out on it tomorrow with more details, and what other caching plugins you should consider using. So watch for that post. Yoast seems to be adding new features to his plugin every week. In the 4.6 update he added a checkbox to mark a post or page as cornerstone content. Building on that, in the latest version 4.7, he added a new dot and checker in the content analysis tool to ensure that your post includes links to more of your content. In other words, when you create cornerstone content, you want to be sure that you cross link to it in every post you can. Internal cross linking ensures that visitors find more of your content to enjoy. That decreases your bounce rate and increases time on site, which improves your Google ranking factors. And, when you have links in your content constantly pointing to certain posts and pages, you’re telling Google which pages and posts are super important on your site. Those are also your cornerstone content. This is something we talked about extensively in the recent SEO Workshop too. So be sure you’re cross linking to your own stuff as much as possible. I saw a post the other day on Facebook from Yoast about his Yoast for Google News plugin. It looks super and does everything you need short of submitting your site to Google News. This is a paid add on for the free Yoast SEO plugin. And as great as his paid plugins are, I just can’t see that me and most of my clients can make full use of them, except for a couple of them. The Local SEO plugin is a must if you have a shop or a service area. And then the WooCommerce SEO plugin is a must if you are using that for your products. Do you have any of the other paid Yoast plugins? If so, please do leave a comment here on the blog or anywhere you see this post online and let us know how and why you’re using it. Y’all may have seen lists on social media, especially Facebook, with 10 bands someone has played in and one of them is a lie. Well, the fun folks over at Search Engine Journal have spun off on that with a post of 10 SEO ranking factors and you have to guess which one is a lie. I couldn’t find any in the list that I thought was a lie. This, despite David Kutcher of Confluent Forms telling us so for the last couple of years at least. You’ll definitely want to read the post for yourself because it’s just too fun to spoil. Should you use a page builder for your web design projects? I placed this tip in the Webmaster section, but I think it’s a good post for all site owners to read, especially if you’re considering a theme revamp in the next year or so. Erin Flynn makes good arguments for why you would, or would not want to consider using a theme builder for your next site design. He also covers the split that’s happening in the design community, where some folks are no longer considered a “real developer” if they don’t hard code everything from scratch. In other words, designers and developers who start with a framework such as Genesis aren’t considered real developers and shouldn’t charge as much for customizing a theme. I’ll add my own $0.02 to this discussion and say that I consider a developer to be someone who primarily focuses on code and structure. A designer is primarily someone who focuses on layout and looks. I have yet to see a developer site that is pretty. And I have yet to see a designer site that doesn’t use some type of plugin to help with structure or user elements, even if that’s Advanced Custom Fields. And unless you run an enterprise level site that requires custom coding, I would advise that you don’t hire a developer to build it for you. Just ask one of my site audit clients that went that route, paid through the nose for it, and had to have a bunch of the custom code changed just to prep the site for HTTPS conversion, or change out simple things like her RSS feed link. It was crazy. Plus, to keep costs in check, designers are turning more and more to frameworks such as Genesis to give them a head start on structure because honestly, that’s where the real cost is. Paint is cheap. Changing things like colors and fonts is not all that expensive. As Erin points out in his post, site design clients are not looking for thousands of lines of custom code. They are looking for solutions that help them make money. And designers that can help them do that for a reasonable price are in demand. If you’re going to use a builder, Erin recommends Beaver Builder, and so do I.
I am no fan of Divi. The code is just too bloated. In fact, I have one client coming off of it and replicating her site in Genesis for that very reason. Erin also recommends starting with Genesis and then using Beaver Builder to augment it. My understanding is that Beaver Builder just released a Genesis integration. And my webmasters say it is a thing of beauty. I also just saw a post from Kim Doyal about the latest Beaver Theme Builder beta release. And this is the same direction that WordPress is going. In fact, that’s a main focus of all the dev work happening this year. They intend to combine the text editor and customizer so that you have more drag and drop capabilities. So, I’m with Erin on this. There is zero shame for designers to help keep their cost down by starting with frameworks and builders and delivering more cost effective solutions for their clients. That said, designers should not bloat the installation with a ton of plugins to make up for what they don’t know how to code in the theme itself. I see that way too often in site audits where a designer has 10 Genesis related plugins, even for things like uploading the favicon. So, if you plan to hire a designer, be sure to check more than the pretty factor in their portfolio. Be sure to ask questions about the backend. And check with their former clients and see how many plugins were actually used, or if things were hard coded into the theme. Need More Help with a Site Revamp? I help site owners learn how to use premium frameworks like Genesis and take them through the theme picking process, as well as developing the spec sheet for the design. That way they are fully ready to enter the design process, and that makes it fast, easy, and a whale of a lot cheaper. Plus, that’s the only way to get a referral to my design team. I only send them well-educated and vetted clients. so useful for me thank you . Fingers crossed that your chat with SiteGround about offering a shared reseller package for managing multiple sites (but not reselling) goes well! It’s just what I need, but I agree, that what they offer now is a tad too expensive. I’m just about ready to move on from my current A2 reseller account as I’m finding it is causing more aggravation than I bargained for. I’m hoping SiteGround offers a better user experience. Right now though there doesn’t seem to be an ideal solution for someone like me with a handful of small client sites to manage but no need for the custom branding offerings/limitations of reseller hosting. Sarah, SiteGround is more expensive for every type of package, but is worth it because they have better hosting and on shared, protect from any account hogging all the covers. There are plenty of hosts that offer reseller packages, but they are either too expensive, or let you oversell, which is an issue. Even if you don’t do it, others will on the same server, which causes everyone issues. I’ll let you know how the chat goes, but I’m not holding my breath.